View More In Nursery Bedding. Ideal for nursing mothers and mothers recovering from C-sections. Sturdy, stable 4-point base adjusts to fit most beds from 22 inch to 34 inch tall. Base easily tucks under bed and requires only 32 inch clearance from wall, making it ideal for small spaces. Includes nightlight, 3 soothing sounds, 3 lullabies, nursing timer and 2 levels of vibration, all with 30-minute auto shutoff. Includes 100% polyester fitted sheet. Sheet is machine washable. Includes 2 storage pockets to keep babys essentials close by. Polyurethane mattress pad is waterproof and contains no toxic flame retardants. 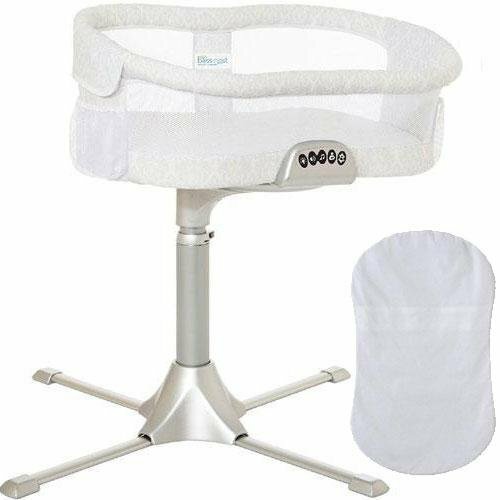 Independently tested to meet or exceed all U.S. Consumer Products Safety Commission and Health Canada safety standards for bassinets. JPMA certified.